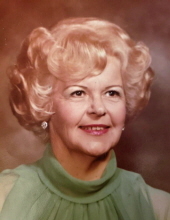 Ruth Marilyn Amundsen age 91, of Elmhurst, IL passed away peacefully on November 29, 2018 in Littleton, CO. She is survived by her children: Cynthia Amundsen, Gary (Debra) Amundsen, Marilyn (Thomas) Peterson; grandchildren: Kari (John David) Reasoner, Kirsten Peterson; and unborn great-granddaughter Reasoner, along with numerous nieces and nephews. Ruth’s husband, Paul Roald Amundsen, preceded Ruth in 2013 but they are now reunited, after 59 ½ years of marriage, with Our Heavenly Father. Born to Theresa & Alvin Ohlson on August 17, 1927 in Chicago, Illinois, her parents and three siblings also preceded her. Ruth grew up singing and dancing while her mother played the piano. Meeting Paul at the Aragon Ballroom, their mutual love of dance continued throughout their marriage. They were also very devoted to the Shrine. Ruth joined the Eastern Star and was Paul’s right hand, as Medinah’s First Lady when he was Potentate in 1979. Ruth was a head Republican precinct judge for many years in Elmhurst. She enjoyed time with family, traveling, dancing and entertaining. When her children were young Ruth enjoyed sewing, and even joined the Welcome Wagon to greet new families to the neighborhood. Ruth moved to Littleton, Colorado four years ago. She soon became instrumental in establishing an “Adopt A Grandparent Program” partnership with local Primrose Preschool of Bear Creek where daughter Lynn is the Assistant Director. Her optimism and smile were contagious! “Grandma Ruth” was loved and adored by all who came to know her! This joint venture will continue as her legacy for many years to come. A “Celebration of Life” Memorial Service will be held on February 17, 2019 from 2-4 pm at Willowbrook Place in Littleton. All who knew and loved Ruth will be welcomed to join the celebration. Private interment. In lieu of flowers, memorials are appreciated, payable and mailed to: “Shriners Hospital for Children” 2211 N. Oak Park Avenue, Chicago, IL 60707 (in honor of Ruth M. Amundsen - Past Potentate Lady 1979). To send flowers or a remembrance gift to the family of Ruth M. Amundsen, please visit our Tribute Store. A Celebration of Life Memorial Service in honor of Ruth. "Email Address" would like to share the life celebration of Ruth M. Amundsen. Click on the "link" to go to share a favorite memory or leave a condolence message for the family.